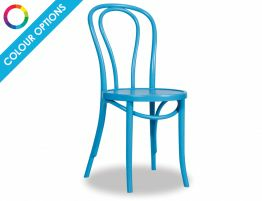 The bold, fun aqua colour adds a contemporary flair to the Vienna café chair. This is an impeccably designed and manufactured dining chair. 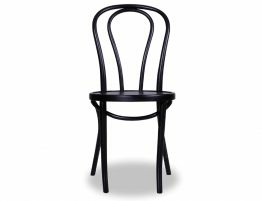 Notice the fine-looking sunburst pattern that is embossed on the seat of our Michael Thonet designed original. Thoughtful design touches like this add to the appeal of this designer original chair. First crafted by Michael Thonet and Sons in 1876, the Michael Thonet designed No.18 original was and continues to be a highly regarded and widely used bentwood dining chair. 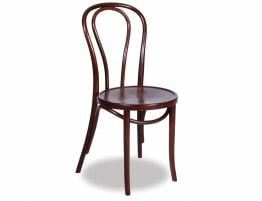 German born Michael Thonet was cabinet maker by trade but quickly built a booming business in factory produced furniture, one of the first of his kind. He experimented with bentwood furniture creations and eventually became widely know and regarded for his bentwood furniture designs. 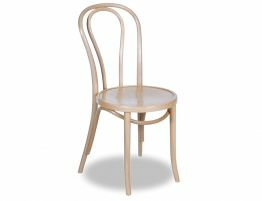 Thonet’s Vienna café chair, also known as the No.18 dining chair, is among the most iconic bentwood chair designs in history. 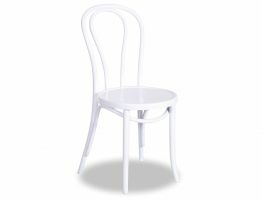 Our aqua café chair is an original Michael Thonet designed chair made in the same Polish factory that the Thonets themsleves founded. Our Aqua blue No.18 Vienna Cafe chair has been constructed with careful and precise attention to the many details that have made this dining chair a popular furniture piece for over 100 years. No detail has been left unattended to.